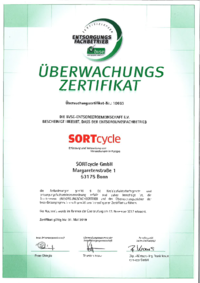 SORTcycle GmbH has been responsible for the disposal and recycling of glass collected in the city of Aachen since 1 January 2017. The contract runs for three years and also covered the provision of the containers for glass packaging and its collection. The clean separation by colour of the used glass packaging is important to ensure that new glass packaging in the respective colour can be manufactured from the used glass. So please remember: White glass belongs in the white glass container, green glass in the green glass container and brown glass in the brown glass container. What about the other colours then, for example, the blue Prosecco bottle? It belongs in the green glass container, because green glass is best at tolerating off-colours without the colour of the new glass packaging being compromised in the manufacturing process. The clean separation by colour optimises the amount of waste glass that can be used in the production of new glass packaging. This saves energy and raw material resources. Consumers can ring the free hotline on 0800 - 94377 51 for information about glass disposal in Aachen.